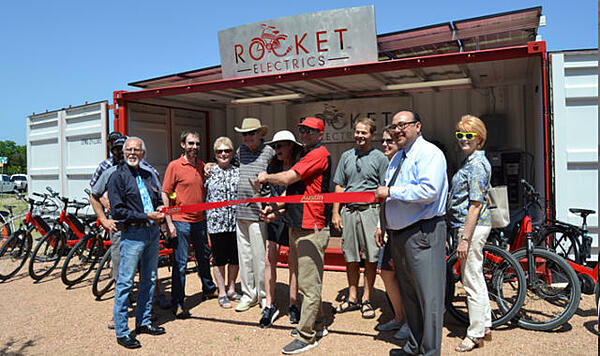 On a sunny Friday afternoon, Rocket Electrics cut the ribbon and opened an auxiliary location Austin’s Mueller community for their e-bike rental business. 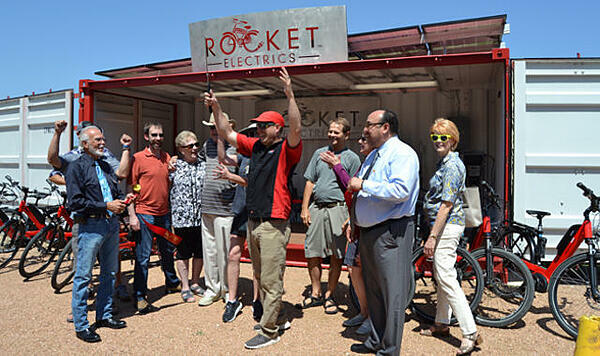 Opening the location marks another step in Rocket Electrics’ mission to save Austin from the woes of traffic by introducing e-bikes, bicycles with rechargeable electric motors. Based in a bright red shipping container modified and painted by Falcon Structures, the new rental location is 100% solar powered so Rocket Electrics can stay green as they grow. When Rocket Electrics’ co-founders Nicole Zinn and John Dawson discovered e-bikes, they were instant converts. Dawson had seen the prominence of bike culture in European countries like Denmark but wasn’t sure how to introduce it to the U.S.
Zinn was so inspired the first time she rode an e-bike that she worked with Dawson to create Rocket Electrics just four months later. The long-standing problem with commuting or running errands by bicycle has been working up a sweat. 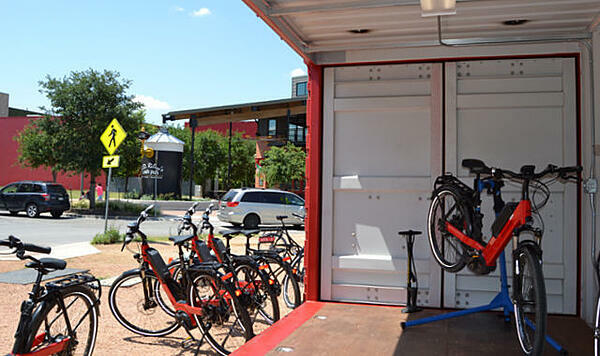 As many would-be bike commuters can attest, riding a bike often means coming to the office winded and soaked in sweat, especially during Austin’s hot summers. Rocket Electrics sells and rents e-bikes with a 30-50 mile range on a single charge, more than enough to propel most people through their commutes. Rocket Electrics cuts the ribbon for their new location. John Dawson is center with the scissors and Nicole Zinn is to his left in the white hat. 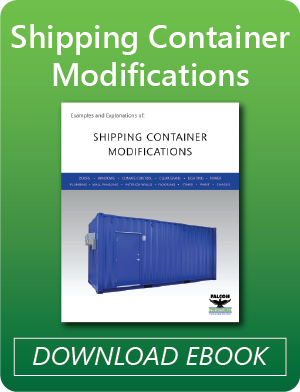 The container has fully opening doors on its sides as opposed to the more common placement on the ends. The solar panel on the roof, supplied by NATiVE, produces enough power to charge the bikes without assistance from the grid. 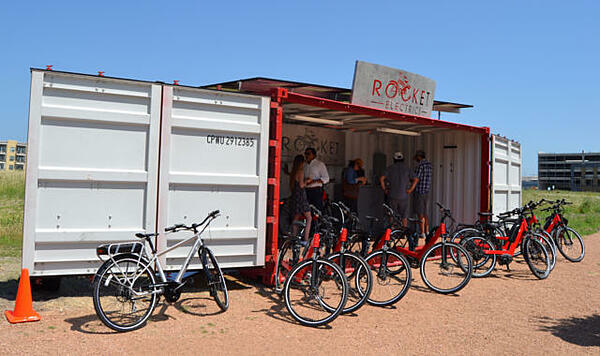 We personally loved Rocket Electric’s creative use of a container and wish them success. Whenever that want to scale up and create more rental locations we’ll be ready with containers to help. Follow Rocket Electrics on twitter and facebook. Looking for a mobile storefront solution? Contact us! We’re happy to answer your questions.